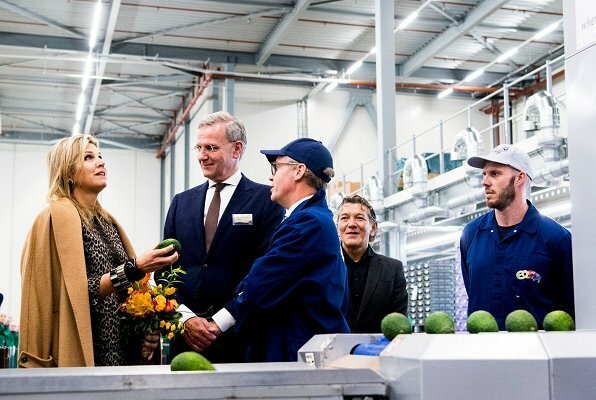 On December 4, 2018, Queen Maxima made a working visit to Eosta Company in Waddinxveen. 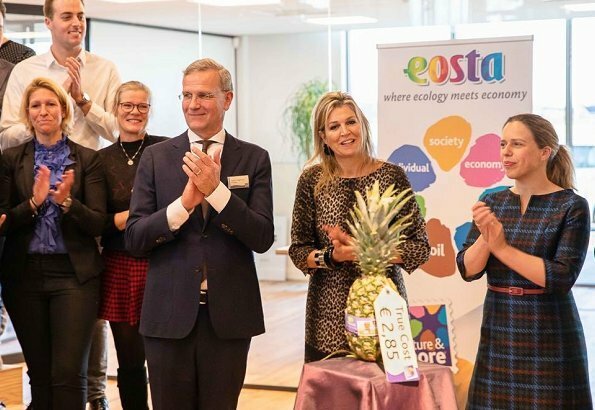 Eosta won the Sustainability Prize (Plaquette voor Duurzaam Ondernemerschap) presented by the King William I Foundation. That award is given to the companies that adapt themselves to sustainable innovation. 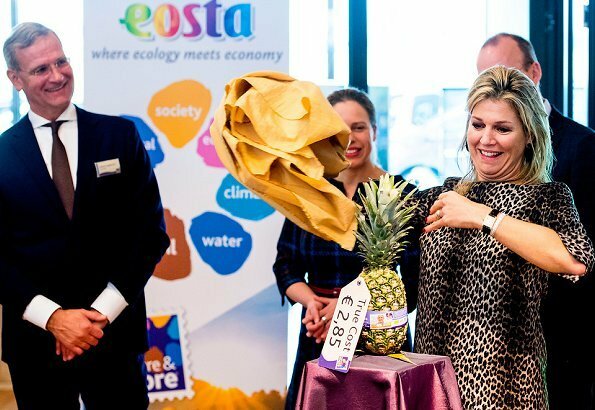 Eosta B.V. is a company based in Waddinxveen, the Netherlands and was established in 1990 and works as an international distributor of organic fresh fruits and vegetables. Bad hair day today as usual! What happened with the lovely hair she had during the G20? I guess she when back to her regular hairdresser in the Netherlands. Not only bad hair, she has to choose between her natural coloring or coloring the roots. This half brown, half blond hair is a disaster. Let's just say that she looks happy and always has such a warm smile en personality, confident and kind. She always looks interested and 'go for it' in what she is doing, no matter what. I'll keep it at that. You know, Queen Maxima has had a wretched year what with her sister passing and her health. She looks like she beginning to get back on track. So bad hair day or not liking what she's wearing, just so very happy to see her happy. Q Maxima looks good again today,love the dress and coat. But she is happy her smile tells all. Por fin vemos a Máxima con un vestido bonito y que le sienta bien. Don't be rude, it's not that bad. Not everyone has perfect and thick hair all the time. And 'ordering' her to put it up is just patronizing. I'm pretty sure, in her position, you wouldn't like being told yourself in this way either. I agree with you, Diane. I think a simple updo would be better, with or without extensions. Not being rude Mijtje - ordering her? You need to rethink as I have never ordered her or anyone to do anything. Ok maybe my children. Maybe you should read a prior comment when I said I figured it out. However she is QUEEN and showing up with messy hair is not ... Queenly. We have discussed this many times here. You must be. ..new. And I believe your tone is rude to me. You have a good day..
LittleOldMe I was not complaining..It was an observation on a fashion blog. Yes, the hair is disappointing, especially when it has been so pretty for the past several engagements. Let's hope it was just a momentary lapse and the other styled, healthy hair will come back. Also, the three chunky bracelets are too much, even for Maxima. I do like her classic coat. Being South American, she is an exuberant person, sort of odd actually that she seems to have adapted really well to a country so different from hers. The Dutch people seem rather strait-laced, and I don't mean that as an insult. I sgguest she cut her hair and try a new style. Princess Charlene has delighted us with her short cut and various styles, and obviously easy to manage with a busy schedule. Lovely coat but the dress is a real miss. Terrible hair again, ugly dress, too many bracelets, but oh yes, that's ok because her smile is genuine?. 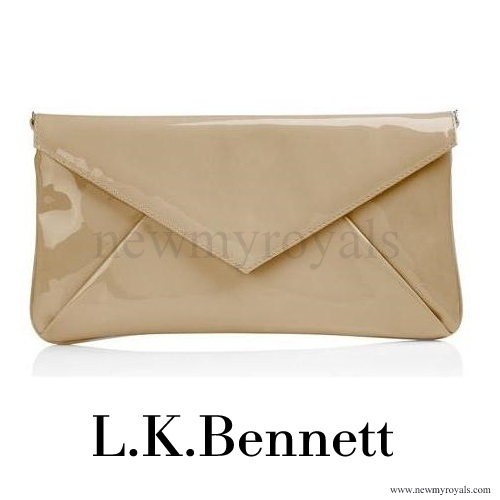 But not only a smile makes a queen, she should be well groomed at all times. She looks a lot better when she's at home in Argentina. Que le pasa a Maxima con su pelo? Lo tiene cada vez peor. El conjunto muy bien. I just want to say that as a long time commentator and viewer here I do feel a bit of hostility here with many new ppl. We never used to have this in here with others calling others names or calling them rude etc. 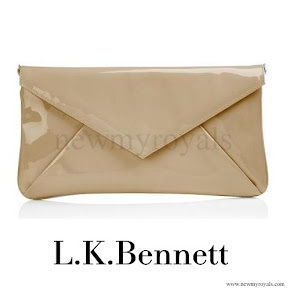 It is a fashion blog. We all agree to disagree at times but that DOES NOT MEAN FREE REIN to attack each other. Ten points to Diane! I am visiting for years as well, and also noticed the hostility sometimes. It's okay to disagree with someone, we all have a different taste and opinion, but we shouldn't bring this in a rude of patronizing way!! The world is already brutal enough, so let's us play nicely with each other!!! She looks terrific in leopard. The coat is a winner, very classic. I wish she had stopped there and not added the bracelets. They were unnecessary. So I'm Dutch but not strait laced Gabriella, no way haha! seems very fine to me. Yes. Healty hair is essential to a well groomed look. Sometimes you just have to start from scratch and do things differently. I do agree Virginia, just give mother nature a fair chance there!